Mr. Roshin from All Saints Mar Thoma Church visited us on Sunday 4th November as part of youth Sunday deputation. Currently studying in Year 10, Roshin delivered a wonderful speech and challenged both Hermon Youth and Kids! Giving example of Saul (Paul), Roshin shared his dedication God’s Kingdom and encouraged everyone to follow Godly way than the wordly one. 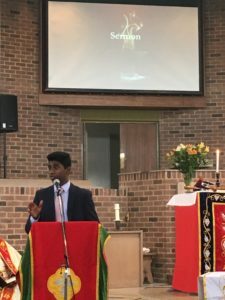 Hermon MTC expresses our sincere thanks to Roshin and especially his parents and Sunday school teacher’s in supporting Roshin’s journey into His Kingdom. May God Bless You.